Developer Zach Gage has a knack for putting together simple, accessible games that you can play for hours on end. 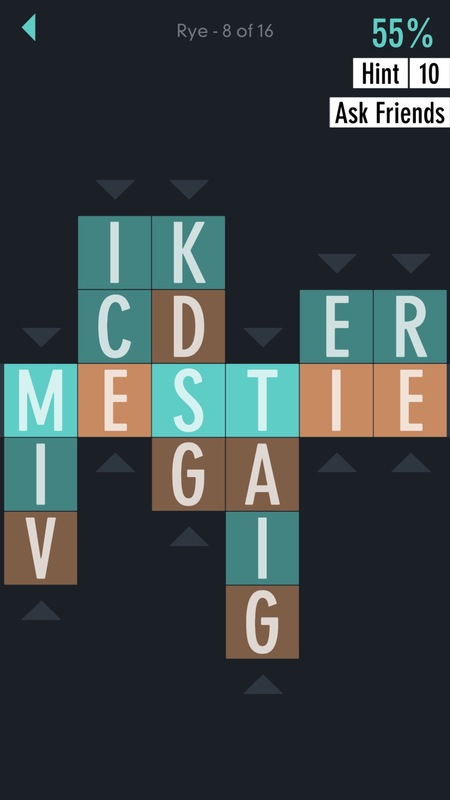 He’s been involved in a number of high-profile iOS games, but one of his earlier hits was the word game SpellTower ($2.99). That was one of those games that seemed to transcend the usual crowd that played mobile games, appearing on the devices of the most unlikely of people. And why not? Word games play well with a large audience for a variety of reasons, and SpellTower was a very good one. Gage is back at the genre with TypeShift (Free) , but I can’t help but feel this is aimed at a very different sort of player. It’s an attractive game with an enjoyable primary mechanic, but there are a few things that keep it from reaching the heights of Gage’s previous tower. The core gameplay in TypeShift involves making words from a bunch of letters arranged on dials. So if the puzzle involves four-letter words, you’ll have four different dials with a group of letters on them. You slide them up and down with your finger, arranging them to make a word. It’s a bit like entering in the combination on a bicycle lock, and although it can be fidgety here and there, it feels good to flick those letters around. 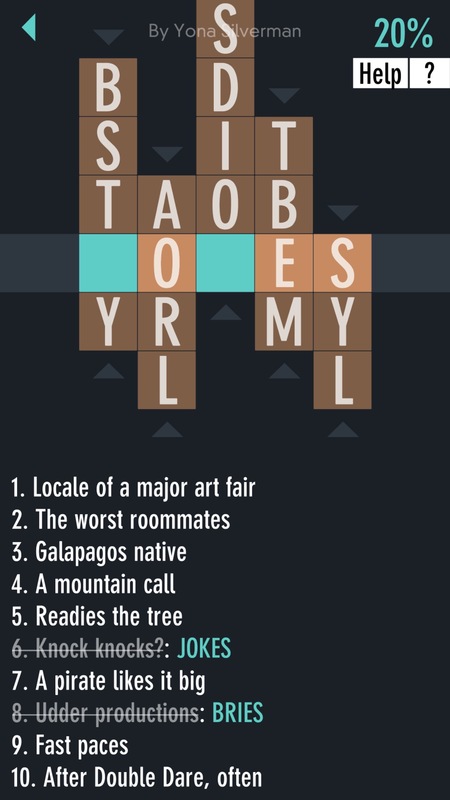 Broadly speaking, there are two types of puzzles to be found in TypeShift. The standard puzzles have you trying to use each of the letters on the dial at least once to make words. There are always a few key words that will check them all off, but if you get there by more roundabout means, that’s also acceptable. The other type of puzzles are called Clue Puzzles. In these, you are given a list of crossword-style hints that you need to check off by spelling the correct word. If letters are no longer needed in this mode, they’ll be cleared off the dial, making it easier to solve the remaining clues. TypeShift uses the Merriam-Webster dictionary as its source, though it also takes into account some plurals and other conjugations that may not appear directly in the book. You’ll often stumble on words you might not have even known existed as you spin the dials around. In the more difficult puzzle packs, those unknown words are very likely to be the ones you need to find to beat the level. Of course, like a combination lock, you can brute force your answers in this game. There’s no penalty for trying out a word that doesn’t exist, save the time spent on entering it in. The game does keep track of your time on each stage, so that’s of some concern if you’re into that kind of thing. If you just want to clear the levels themselves, there’s nothing to discourage guessing like wild. In a way, TypeShift makes it easier on the player. You have a finite amount of letters to work with, and with each position being limited to a handful of letters, that narrows things down even further. You also know that there are magic bullet words that will bring things to a swift end. You just have to find them. There are no impossible situations, in other words. But all of that has the odd effect of making the game a little aggravating. It’s easy to give into despair when you’ve got one letter left and can’t figure out any words that will use it, and knowing that there’s some silly word you’ve overlooked only makes it more frustrating. At this point, it’s hard to avoid the temptation of just forcing an answer by trying combinations methodically, which feels like it’s not really what the design intended. Timing the stages is an interesting idea that ought to promote replays. Unfortunately when you clear a stage, the game shows you the key words that solve it as quickly as possible. You can then go right back in and use those words to get a time you would likely never beat naturally. It also doesn’t seem to record your best time outside of the Daily Puzzle, so it’s not as useful a metric as you might hope for. Like in many other fine puzzle games, you’ll have to consign yourself to the idea of only playing each puzzle once and not going back for another try until you’ve completely forgotten it. Luckily, the game has a ton of content available, so you probably won’t be thinking about replaying any levels for a long while. The free version gives you a healthy taste of both types of puzzle modes, covering a wide range of challenge levels. After you’ve finished those up, the game has plenty of extra packs to sell you for reasonable prices. The whole lot would run about $13 at present prices, which seems fair for the amount of playtime that represents. Until you buy something, you’ll see ads pop up every now and then, but as soon as you’ve made any purchase, they’ll be gone. The game also sells hints in various packs through IAPs. It also hands them out through incentivized ads. You can use those hints to help you get through any puzzles that are truly stymieing you, though they’re individually of very little value. They only move a single dial to the correct position, which might be enough to nudge you to the answer or not. It’s not a big deal, though. You can attempt any puzzle you want from the packs you own at any time, so you don’t need to clear one to get to the next. If you’re really stuck, it’s just as easy to go try some of the other levels and come back with a fresh set of eyes. Ultimately, one of the appealing points of word games is that they usually allow the player to feel like they’re charting their own course. You think up the words yourself, so you feel clever. 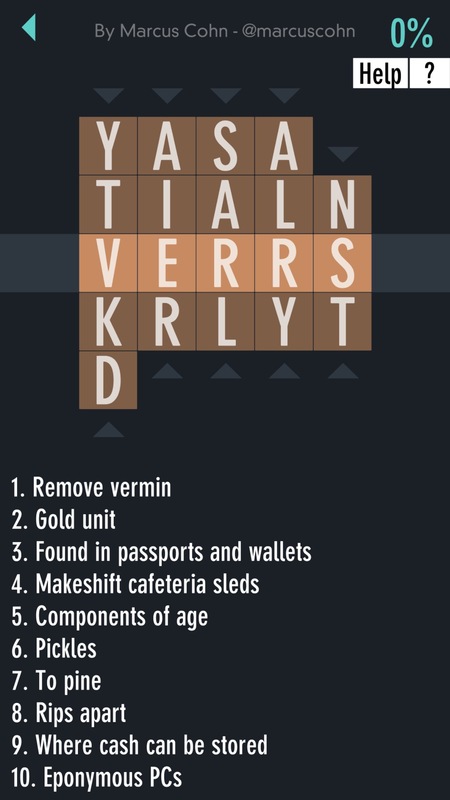 TypeShift being solution-based rather than open-ended doesn’t close that door by nature, but its routine of showing you the best words at the end of each level is a constant reminder that there’s a single best answer, and you probably didn’t find it. The only incentive to play properly is to beat the puzzles in a shorter amount of time, but what is that really good for once you’ve seen the optimal solution? That’s probably why I ended up enjoying myself the most with the Clue Puzzles. They’re harder to brute force since you have to match each word to its clue, and there’s less fluff hanging from them in terms of goals. There’s also a Daily Puzzle that gets around the problem of showing you the solution by only letting you take one crack at it. But even there, the temptation to just flick the dials can be strong. Now, I really like TypeShift. I think it’s an awfully fun game, and I always found myself coming back to it not long after putting it down over some irritating puzzle or another. But its various parts don’t quite lock together as well as smoothly as you might hope, leaving the overall experience a little wanting. It’s also a bit of a battery hog, surprisingly enough. If you enjoy word games, you’ll almost certainly want to check this one out in spite of the little problems I’ve mentioned. There are tons of free puzzles to try out that should give you a solid idea of whether this is your thing or not. TypeShift might not have the accessible charms of SpellTower, but it does quite well in carving out a different sort of enjoyment all to itself.